As a child of the West Coast, I always felt I knew north from south and east from west based on where the Pacific Ocean lies in relation to anywhere I stood. 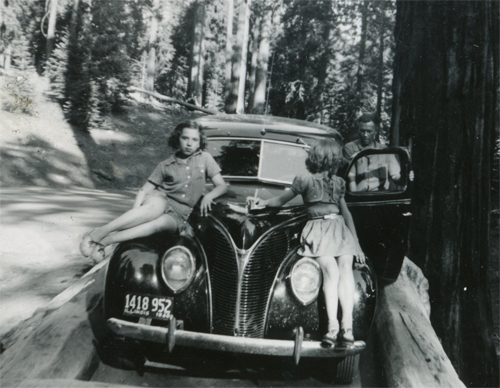 Family vacations from the low gray cloud cover of the Pacific Northwest more often than not involved piling into a large Chevrolet and barreling southward via the passes of the Siskiyou Mountains and Mt. Shasta through the olive groves and rolling hills of California. I can still feel the sweat pouring from my pre-teen thighs as they stuck to the vinyl upholstery while crammed in the back seat with my brothers in the years before every car came with air conditioning. 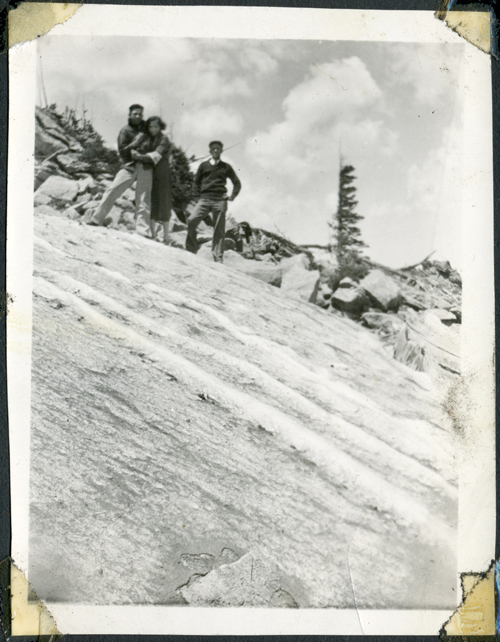 Grandpa, Grandma & our Great Uncle in a late 1920s trip to Pike's Peak, Colorado. My mother’s family hailed from Southern Illinois and over the years they treated us to a number of animated road trip stories and photos that seemed ancient. Our maternal grandparents took western vacations as soon as the progress of automobiles allowed for such daunting trips and thankfully they brought a camera with them. A lover of Tom Mix, Buck Jones and Gene Autry, the West held my Grandfather’s imagination and it was a beloved legacy he warmly shared. There was no destination as grand as Pike’s Peak, the Painted Desert, Grand Canyon, Yellowstone or the Redwoods. 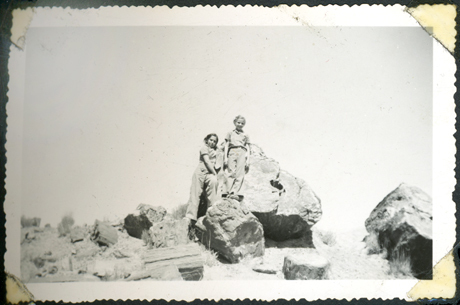 My Aunt and Mother, Petrified Forest, Arizona, 1940. 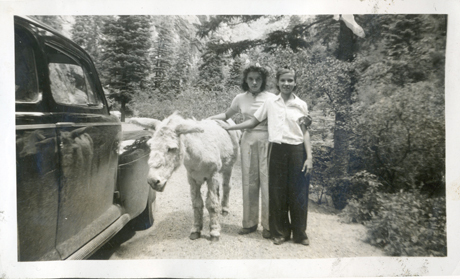 Aunty and Mom with the old Ford and a friend, a few years later - early 1940s. The promise of work at the Columbia River Shipyards in the 1940s was a lure both sets of my Grandparents could not deny as the country struggled to fortify its fleet following the bombing of Pearl Harbor. As Grandpa told the story, they drove as far West as their gas rations would take them. Whether it was a tough decision or not, never entered the narrative when my Grandparents seized the opportunity to move west with their children. As the years progressed everyone in the family became deeply involved in building lives and exploring this new place with its deep wilderness so close at hand. There were dams and locks, fisheries and rodeos to explore, not to mention the ocean with clams to dig and driftwood and sand dollars and wild blackberries to gather. 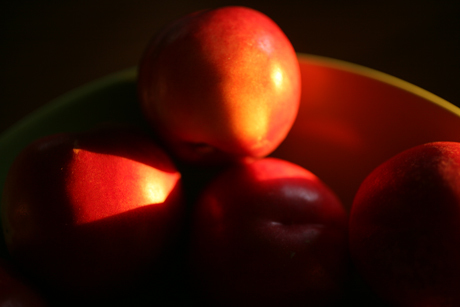 We were not hunters – we were gatherers and growers. And as the photos attest, we were three generations of posers. The immensity of the Cascade Range, the Columbia River Gorge and the Sierras remains a compelling backdrop, to say nothing of the roadside attractions along the way. 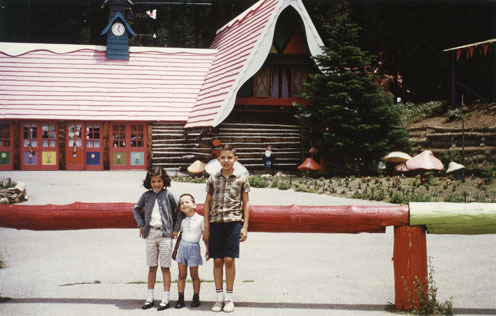 My grandmother often had a box camera at the ready and Dad learned photography while stationed in Alaska in the early 1950s, thankfully documenting many getaways in color transparency. The family slide show was a rare but beloved tradition and we roared with laughter at the most unflattering photos of the women in the cat-eye glasses of the early 1960s. The many shots in which Grandpa’s Pendleton wool clad arm hung to his side but pointed his index finger as if at some spot on the ground was rivaled only by Grandma’s giant purse, which she held proudly at every point of interest where she was photographed. My father was also a reader of historical plaques. We sulked our way through every trip, rolling our eyes while waiting for him to read another dull bronze text only to find ourselves forty years later reading every plaque we encounter. I finally get it. In takes some history to find anything interesting about history. 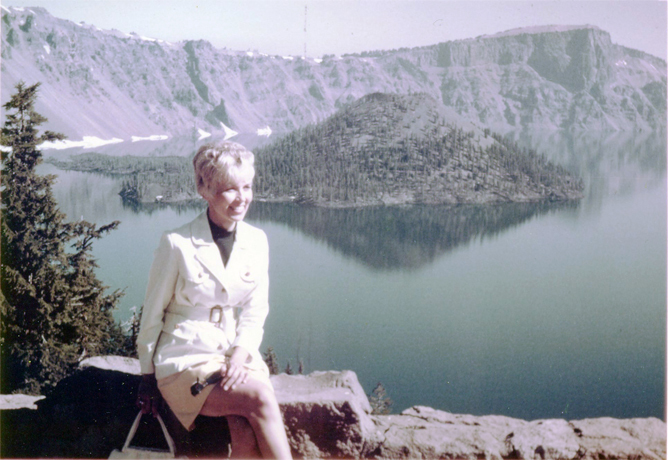 Mom at Crater Lake, circa 1967, shot with Dad's Argus 35mm rangefinder. Over the years, Mom was the only one in the family I ever heard who struggled in her longing for the old days and extended family in Illinois. It’s not that she didn’t love the West, but she was torn. Her childhood family moved in one direction. Her heart moved here and back again. She shared her own children’s sense of dread each time we moved and we moved often, up and down the coast and back and forth. When I learned about Manifest Destiny at Chinook Junior High in Bellevue, Washington, it struck a chord with me. Both the adventure and the anxiety of exploring or moving are compelling forces. The grandiose title stuck in my mind. In spite of the politics of the time in which the term was coined, it stayed with me as a kind of lifetime experience. I write this a month after Mom’s passing and while I wasn’t thinking of her when I conceived of the photography exhibition “Manifest Destiny,” I realize now my family’s role in forming the idea. 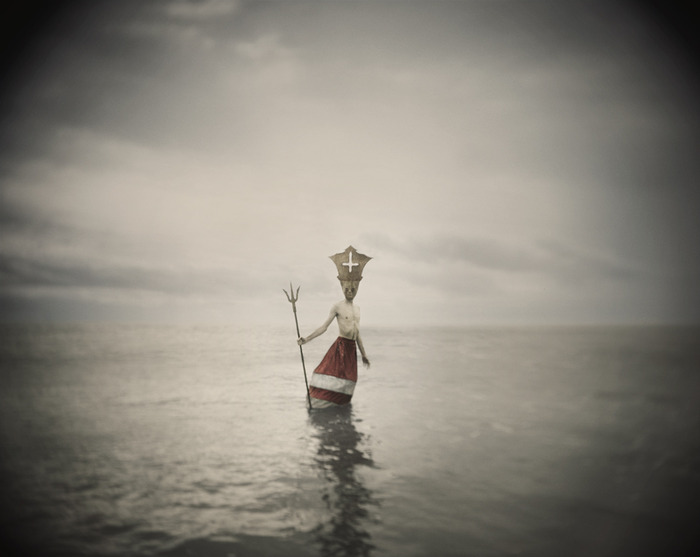 Manifest Destiny opens at the Analog Salon in Culver City California on January 28 and runs through March 17, 2012. We came on foot, on horseback, by train, by ship and eventually by car and airplane. We came west for a multitude of reasons: for adventure, for economic opportunity, to escape the crowds of the East. 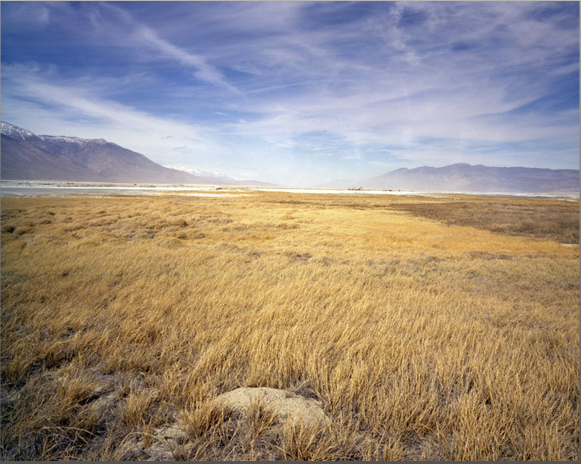 Our quest over the last 200 years led to the discovery of a great expansive and rugged geography, of open range and potential farmland, of rich forests, wildlife, bountiful rivers and streams, to otherworldly desert scapes and to the vastness of the Pacific Ocean. While the term Manifest Destiny was used in the 19th century to promote transcontinental expansion and provide justification for the war with Mexico, it brought devastation to America’s native cultures. This exhibition is built more broadly around the concept of Western movement, of the need to discover what there is to find beyond the next hill. Our West Coast of the present has been exploited and broadly tamed by the generations that followed the original intrepid explorers and native peoples before them. 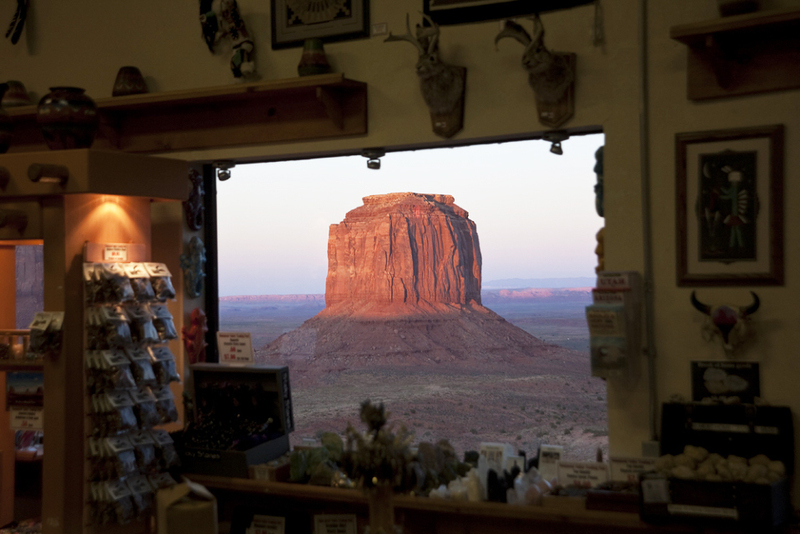 The romance of the West still lingers, however, fascinating us with its wildness, its opportunity, it’s modernism, light, water, open mindedness, creative ingenuity as well as with its withering assets. 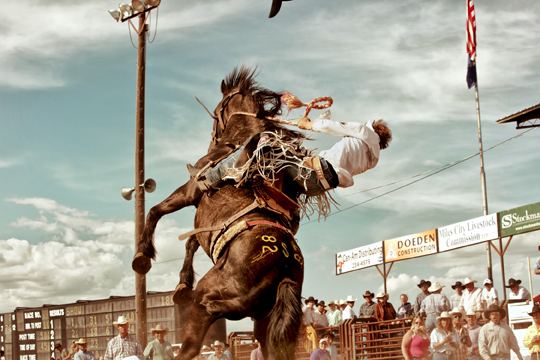 “As for the rodeo, a friend bought a small dude ranch in Miles City, Montana and was in the market for some cattle. I had become interested in photographing bull riders after attending a few Professional Bull Riders events. Trying to get in to photograph the PBR guys was very difficult. They are professional athletes isolated by the same machine that regulates access to celebrities. By contrast, Miles City was a slow-paced, action-packed drama. After arranging for a bogus press pass, I could go anywhere, do anything. Growing up in Los Angeles, the Bucking horse sale felt like an artifact from a period in time that will soon disappear. It was spectacular.” Randi Berez attended UC Berkeley and has photographed for Esquire, Fast Company, Men’s Health, The New York Times Magazine, ESPN, Men’s Journal, Outside, Women’s Health, Life and others. Her commercial clients include Nike, Adidas, Converse, and Samsung. “Shooting at SpaceX was like shooting at a top secret military facility. I was struck by the enormity of the space; the building is a vast expanse with super tall ceilings, huge hanger doors, and slick concrete floors. Of course the best part of spacex is their hardware. 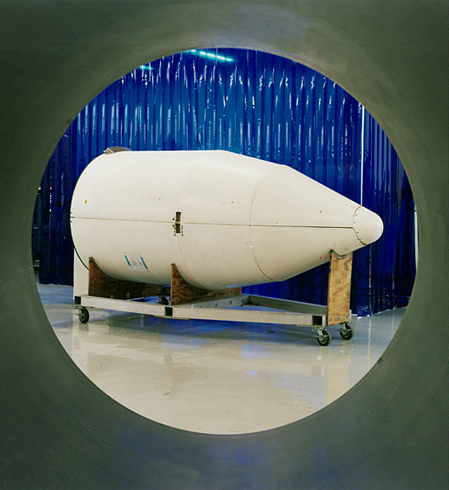 I love all things space… so to stand next to, and photograph their capsules, rocket engines, rocket bodies, fuel tanks, etc. was fantastic! It was cool to imagine shooting something that would hopefully, soon be flying in the outer edges of our atmosphere.” Raised in Las Vegas, Michael Kelley attended UCLA and then Art Center. 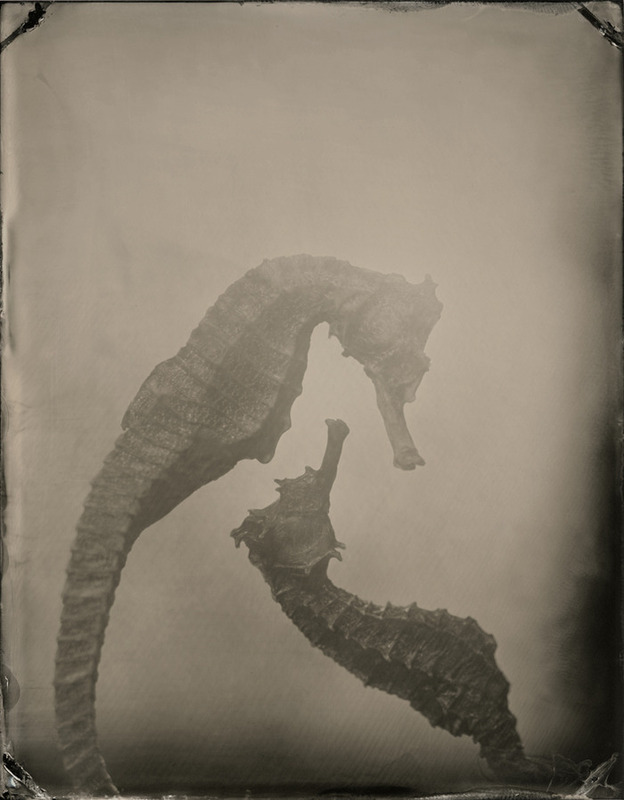 He has received awards from the Communication Arts Annual, American Photography Annual, PDN, and the Association of Advertising Photographers. 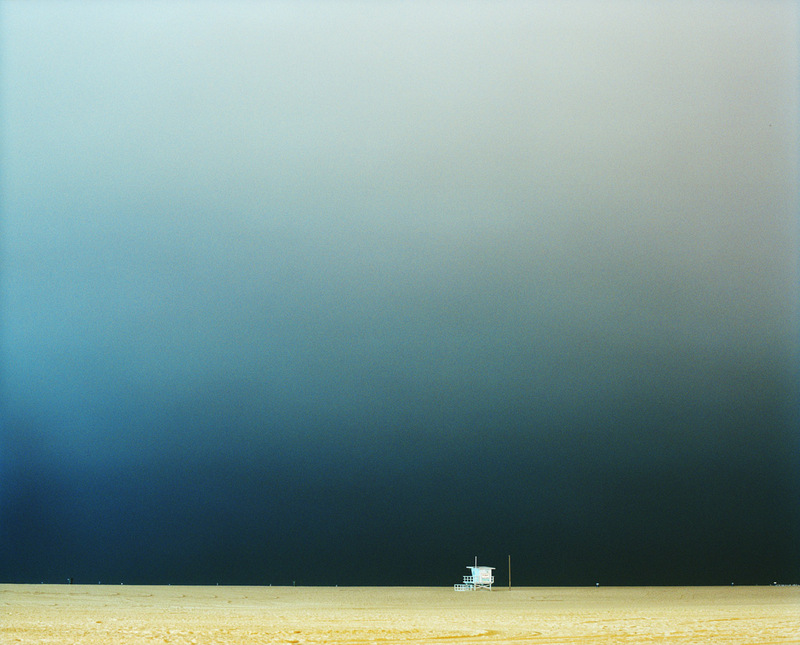 “The images are from a project on the architecture and landscape of Los Angeles. 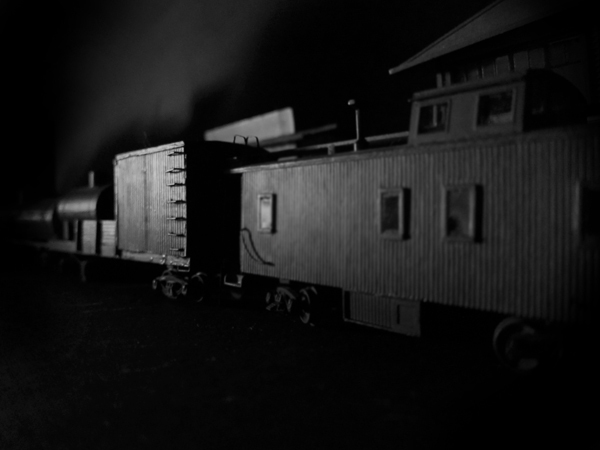 They function as an idealized survey of the city and aim to communicate my vision of the city. My goal is to display a landscape that is both modern and democratic, minimal and egalitarian. I began the project in college and have just recently started an effort to finish the series and release a book.” Nicholas Alan Cope’s photographs have been published in Interview, Japanese Vogue, Conveyor, Unpublished, The Wild Magazine, DigiFoto, ButDoesItFloat, 500 Photographers, L’Architecture d’aujourd’hui, Good, Surface and Filler. 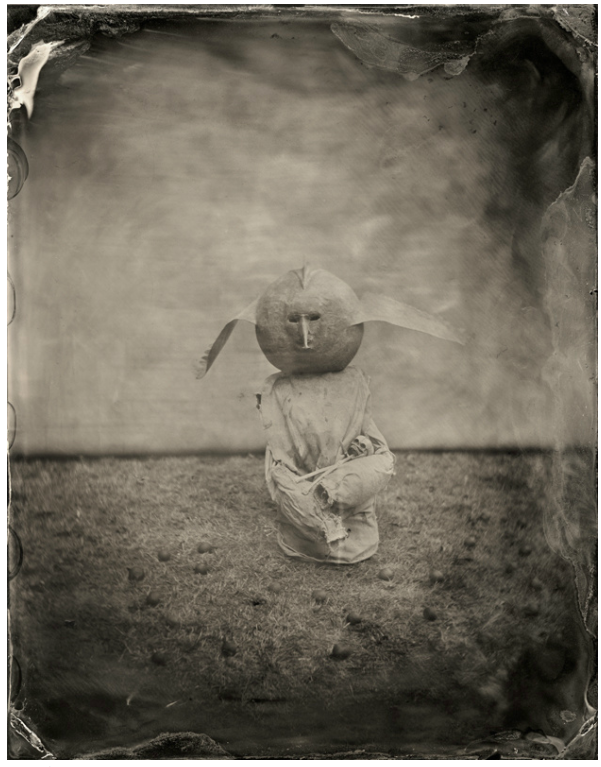 Awards include Communication Arts Photo Annual 2011, PDN’s 30 2011, American Photography 26 Selection 2010, Surface Magazine’s Avant Guardian 2009, PX3 Winner 2008. 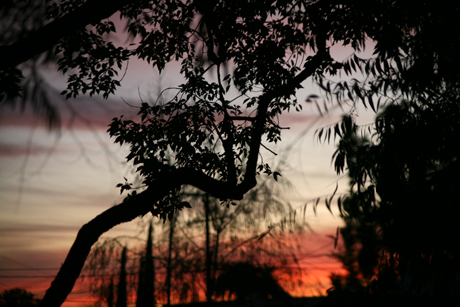 “Growing up in the Northwest It might be a DNA mandate that I love trees. 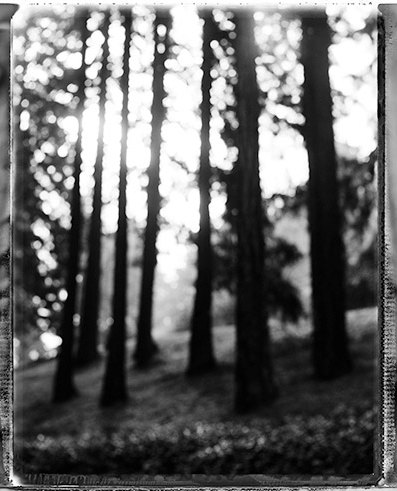 I love to study the light, space and weight of a forest and will forever be drawn to the raw beauty.” Seattle born Lisa Romerein studied photojournalism at Stanford University. She lives in Santa Monica where she specializes in food, travel, architecture, interior, garden, and portrait photography for a client list that includes Martha Stewart Living, Vanity Fair, Sunset, Town and Country and House Beautiful as well as major hotel and architectural firms. In addition, her photographs have appeared in numerous food and lifestyle books. The Analog Salon is a fine art photographic exhibition space housed at Samitaur Constructs, the noted architectural firm, in partnership with Digital Fusion, a premiere digital photographic rental and post-production facility. 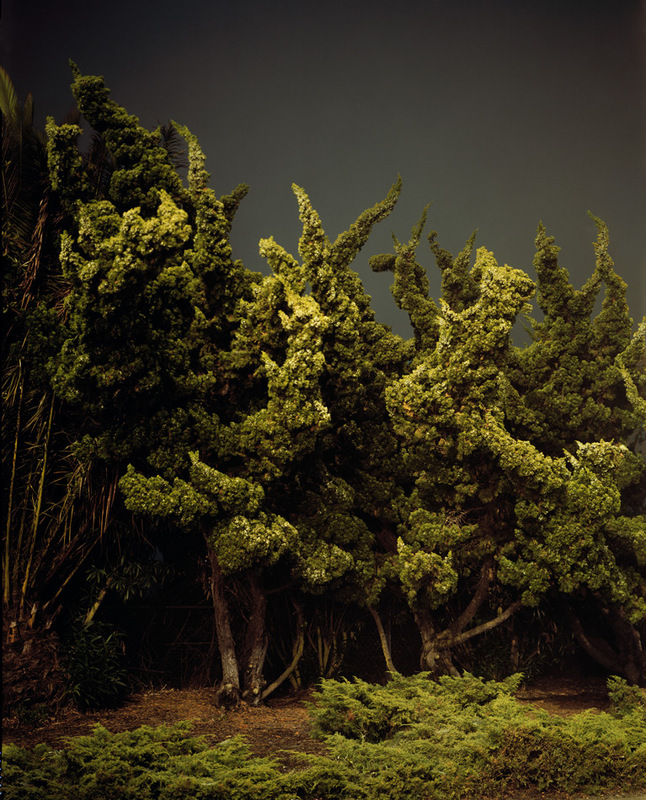 The Analog Salon highlights the exceptional talent of new, emerging and established photographers with an emphasis on Los Angeles based artists. http://gallery-store.digitalfusion.net/The-Analog-Salon/ Note: work from the Manifest Destiny exhibition will appear in the online store only after the show opens. I was surprised to find myself thinking of graduate school while traveling in Southern France this autumn. While working on my masters in studio art, I was a teacher’s assistant for a number of classes including one with the amusing title, “Museum Problems.” One could interpret that in any number of ways and while it sounded like a silly construct of a course, it ended up being one of those experiences that taught useful tools regarding the powers of institutions to enforce particular lines of thinking. It also conjured up questions of what constituted a museum and what it meant when the work of a person of color or a woman was relegated to a location with poor sightlines or offered the least amount of foot traffic. Curators, museum directors and even docents have always had the power to conduct how work is viewed, received, interpreted. In a trip planned with 1000-year-old architecture in mind and countryside full of farms and vineyards but little to do with the pursuit of gallery art, it was odd to find myself thinking about museums and their problems. Even so, after a few days in Italy, we found ourselves taking a break from our road trip in the beautiful city of Menton, France, not far from the southern border. Like other cities and villages on the Riviera, Menton is a mix of stunning buildings (from the medieval to modern) and gorgeous blue waters in close proximity to a mountainous coastline. 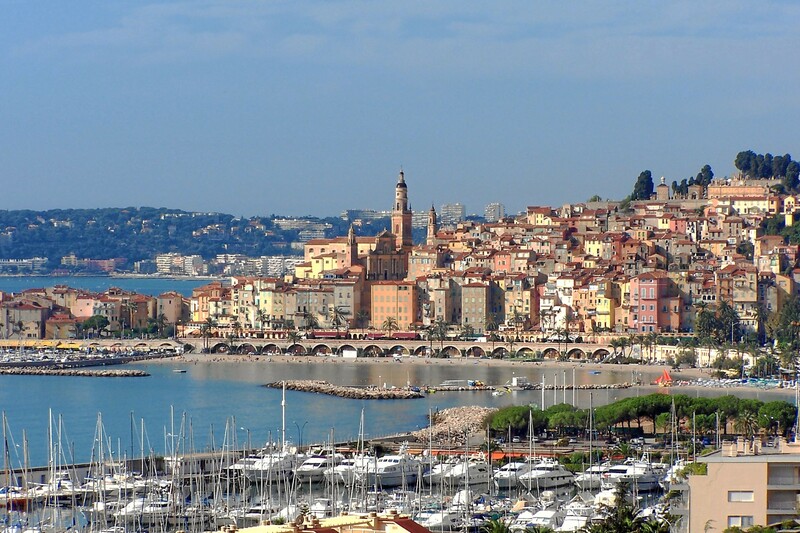 Menton also offered a welcome respite from the death-defying experience of driving the Italian freeways. In the post-road pursuit of a restroom we ducked into the old fortress on the beach, the Bastion. Unfortunately, the fort was closed in its transition from housing a small collection of the work of Jean Cocteau to a nearby new museum built in his honor. 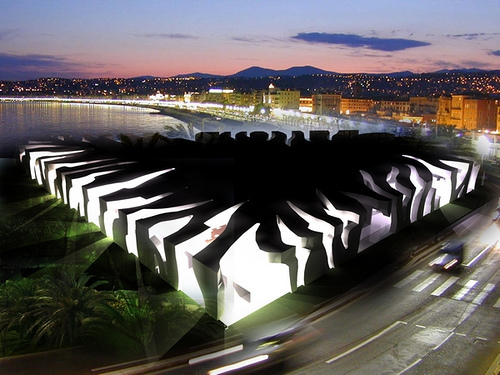 The Jean Cocteau Severin Wunderman Collection Museum, scheduled to open to the public later this fall, is a sprawling contemporary surrealist affair designed by Rudy Ricciotti. Thankfully it has a low architectural profile so that it doesn’t interrupt the postcard-perfect view. 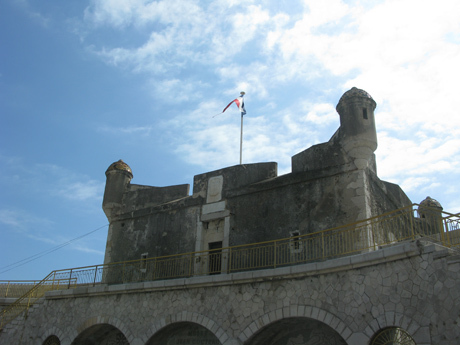 Bastion of Menton, built in 1636, where the old Musee Jean Cocteau was located. 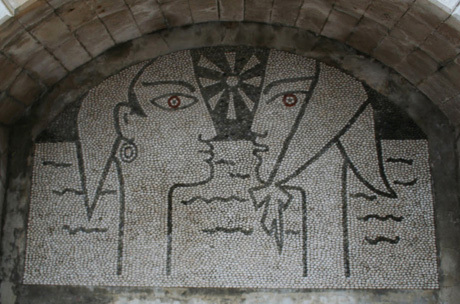 One of Cocteau's pebble mosaics on the exterior of the Bastion. The Severin Wunderman Museum, once located on the upper floor of the Severin Group’s Irvine, California warehouse, was one of the oddest locations for a “museum” that I’ve ever experienced. As the sole manufacturer of watches for Gucci, Severin Wunderman had amassed an extensive collection of the works of Jean Cocteau and it was available for viewing by appointment only. Driving through the clean winding streets of outer Irvine in the mid ’90s, there was not a pedestrian in sight. It was the kind of neighborhood featuring the types of businesses in which there is little clue, beyond logo, of what lies within. The group of students I took to the museum entered through the loading dock where cases of elegant watches were standing in shipping crates bound for the showcases of Gucci. There we were met by a staff member and taken upstairs to what felt like a secret collection. On display were a number of the French surrealist’s drawings, photographs, ceramics, books and posters, literally housed in a large over-lit office space with low acoustical-tiled ceilings and an aura of light industrial complex blandness that could not have been further from the quality or source of the work. I’m sure my memory fails me here but somehow, I associate carpeted walls with the installation. 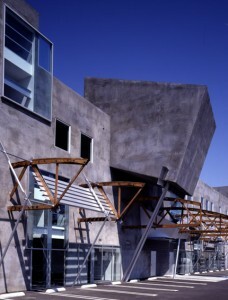 The museum was clearly a collection that had outgrown its owner’s home and storage capabilities. The beauty of it was that Severin Wunderman chose to share it as best he could. Apparently, he once negotiated with the city of Laguna Beach, California, hoping to move the collection from Irvine to Laguna, keeping it close at hand. Negotiations fell apart over parking issues, however, and most certainly Wunderman’s well-publicized temper played a role. Upon his decision to return to his native Europe, he left the collection to Menton. 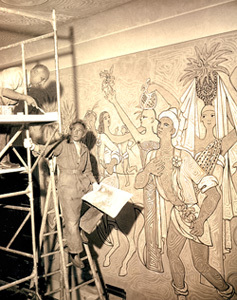 Cocteau at work in Menton's town hall. 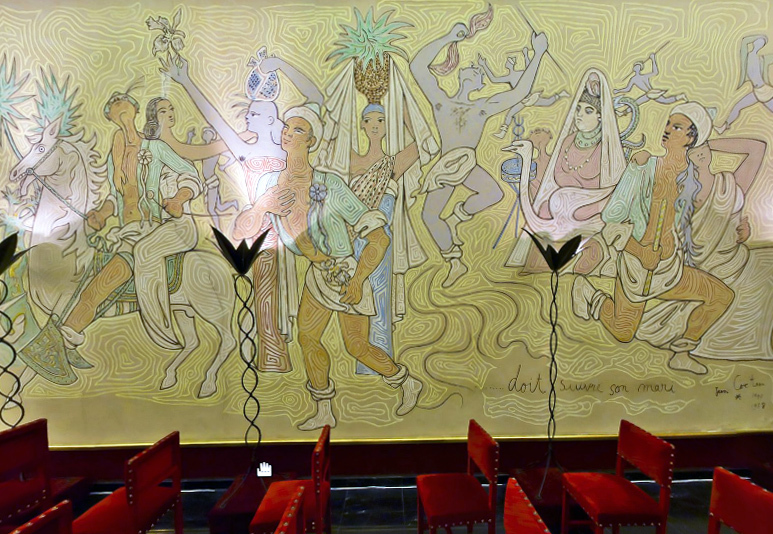 The wedding room murals, Menton town hall. 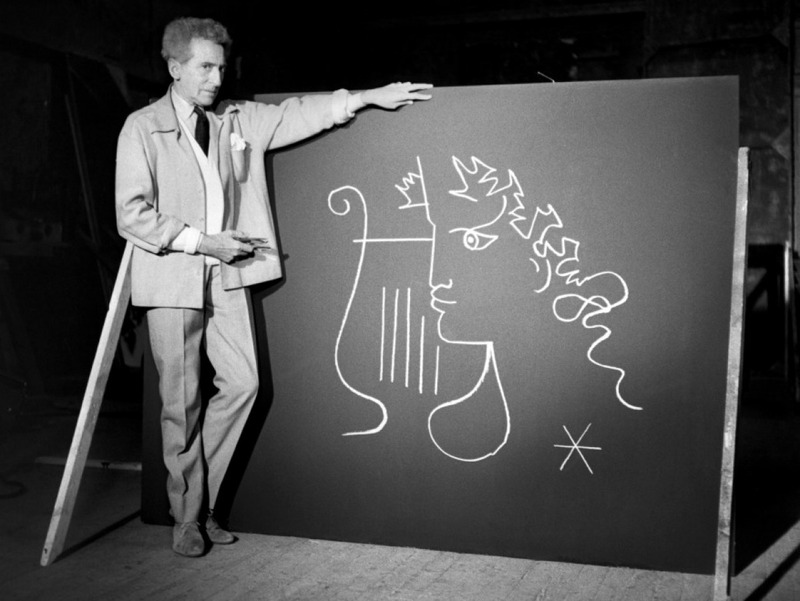 Over the years Jean Cocteau traveled to Menton many times and created several major paintings there prior to his death in 1963. The enormous murals he painted for the wedding room at the town hall, transformed the entire room into a work of art. This history links Cocteau naturally to Menton and makes a perfect case for the Wunderman collection landing in the city. 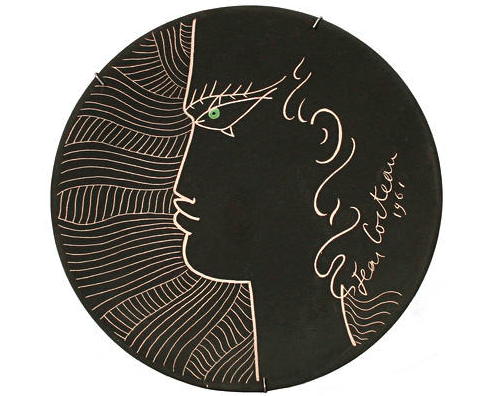 Severin Wunderman’s bequest includes 1,800 works, 990 of which are by Jean Cocteau, including drawings, painting, pebble mosaics, ceramics, tapestries, jewelry, photography, audio and cinema. 450 works are by Cocteau’s friends including Picasso, De Chirico, Miró, and Modigliani, as well as hundreds having to do with Sarah Bernhardt, for whom Cocteau coined the term monstre sacré (referring to the hysteria inspired by divas of the stage). While 35 or so of the artworks were recently rumored to be fakes, the lion’s share should make a formidable presentation especially located in such a grand setting. It was an unusual coincidence to have the Cocteau collection cross my path again so far from where I’d first seen it. I regret that it wasn’t open to see the full collection. 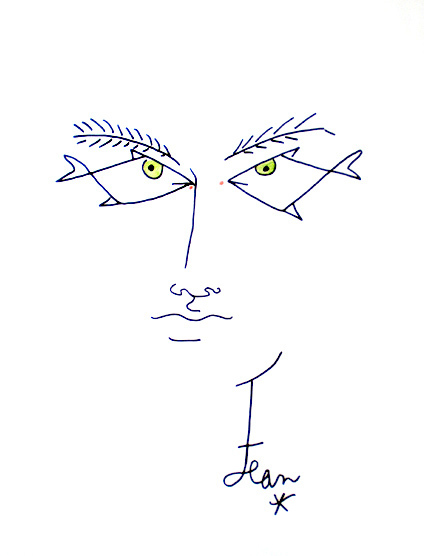 Nonetheless, I’m thrilled the work has a more suitable and appropriate home in a town with a historic connection to Jean Cocteau himself. Museum problem solved. 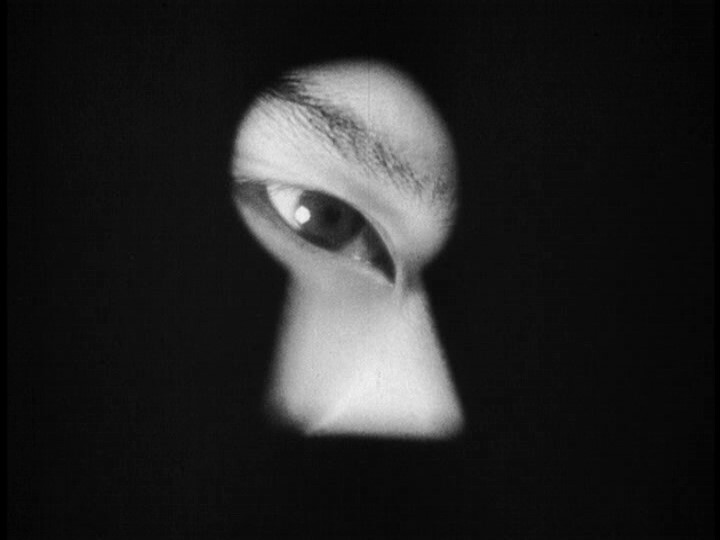 If you’ve never seen Cocteau’s films you’ve missed a visual treasure. 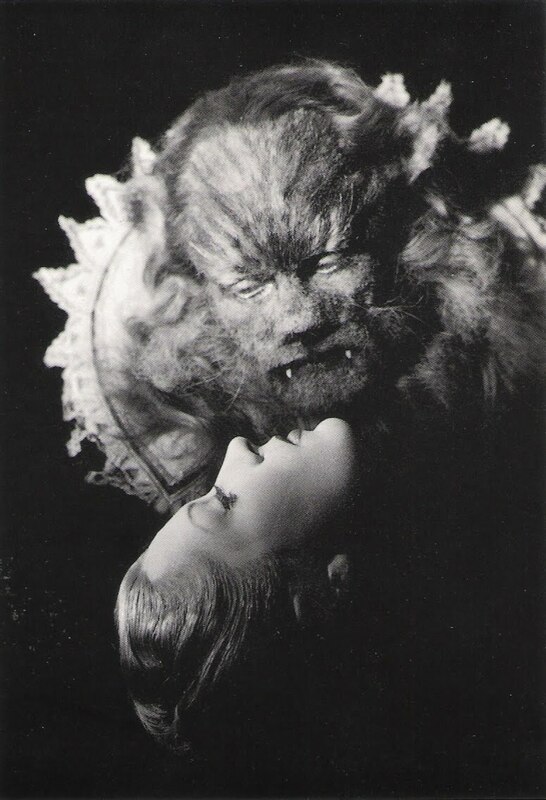 All of his cinematic works are inspiring photographically and regarding his 1945 version of “Beauty and the Beast, Halloween would be a great time to revisit. Many things in Los Angeles are reminiscent of the classic Western movie façade. A willing suspension of disbelief allows us to imagine all sorts of fictions. No stranger to a rapid pace lifestyle, intense work pressures and mind-numbing gridlock, longtime residents know the importance of finding their spot: a place to take shelter, to make a little green, to calm down. It’s important. We live in something of an illusion if we can find it. On one side, our particular oasis borders a strip of tired old apartment buildings and newer, shoddily constructed condominiums. The area was once low farmland fed by the runoff from the Hollywood Hills. It had moisture the rest of the city didn’t have. Plants were meant to grow here. The neighborhood’s south and west sides have lovely 1920s homes with ample yards, protected by zoning that is dedicated to the single family home. Sadly, to the north and east, the buffer of homes that stand between opportunistic development and us, is getting smaller. As it turned out, our side of the street is zoned for both single family and multiple units. A multiple tenant building in the 1920s meant a quaint Spanish duplex, whereas now it can easily refer to a 20-unit complex of dubious design with twice that number of cars owned by its inhabitants. 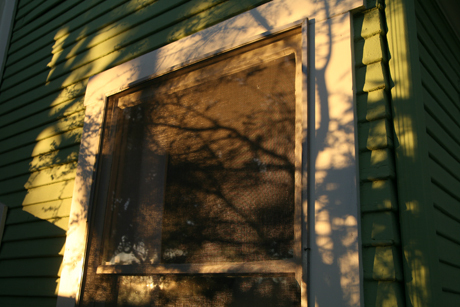 When we fell in love with this house, the fluttering leaves out each and every window seduced us away from concerns about the clutter to the north. The zoning wasn’t something we focused on, although for years we’ve directed visitors to drive here through the prettier route. Unfortunately, growth is now encroaching and it’s not the growth of gardens, but of more cement, rebar, and lots and lots of stucco. Up until now we sat in our house and faced away from it all. We were able to maintain something of an illusion of spaciousness, of a natural world – the mirage of a better reality, right in the middle of the city. 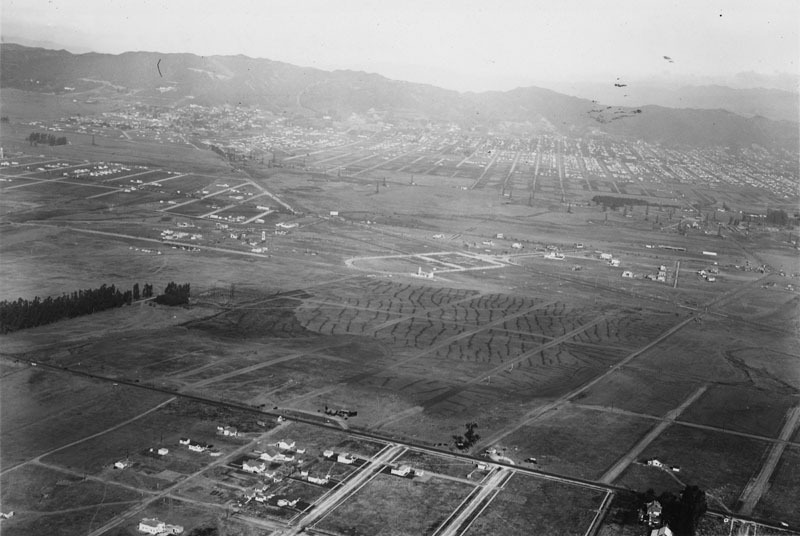 The land where our house now rests is located just below the bottom left corner of this 1923 photograph of Los Angeles. Farmland covered the middle of the photograph with oil rigs dotting the fields at the Gilmore Ranch a couple of miles north and the closest developed neighborhoods nestling the Hollywood Hills at the top of the frame. It’s amazing how a sense of calm can be immediately altered with a single phone call. It’s not as though someone died or was harmed, thankfully, but for a household whose members have each moved enough for a lifetime, our sense of feeling settled down was tremendously altered. The voice on the telephone said he was with a development company. He spoke of other projects his company constructed, but wasn’t specific. The website for the company showed grandiose condominiums – shiny steel and glass. He offered to buy our house and would pay in cash. First came the carrot and then, the stick. His plan was to demolish and build a condominium of unspecified size, upon our lot. When we recovered from the shock at the thought, we asked if keeping the house and moving it to a new location was an option. He had no objection, yet there is so little available vacant land in the city, that the proposition of moving it would be unrealistic. How ironic to think of the house moving once again. Ed and Tina, our 90-year-old neighbors across the street tell us of hearing an incredible rumbling one day 32 years ago. Walking out onto their lawn they saw our little old house rolling down the street on the bed of a truck. Their home is the first on the street, built in the early 20s when only a few farmhouses sat near Ballona Creek (now a paved viaduct). They compliment us on the new green we used to paint the house and tell us how fond they are of looking out to the sycamore trees as they go out to fetch their newspaper each day. I can’t imagine inflicting their last days with the unsightly view of an enormous condominium complex, not to mention the cutting down of the trees and demolition that would accompany it. Since that phone call, we’ve gained some information but remain confused. Not having the heart to sell our wonderful home to developers, it took no time at all to decide it wasn’t an option. We could not willingly subject our surrounding neighborhood to the monstrosity that would surely be built and we couldn’t live with ourselves if we destroyed the spirit of this sweet house. It’s also not possible to replace this kind of ambiance, within our means, in the city. Apparently, the owners of the rental house next door got the call as well, and the fact that they haven’t returned our calls has us spooked. We don’t know if any of the other five houses left on the block received calls and consequently, we don’t know if people in them have made decisions. 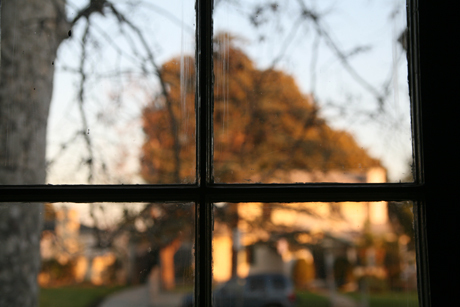 The chance to sell out in a diminished housing market may be tempting to some, while the potential to weaken the value of our investment is something we can’t afford to ignore, even if the light is pretty and the trees are tall. We may find ourselves forced to offer the house for a regular sale to a person who wants the house in spite of the potential for a 3-story condo next door. Even writing that makes me feel like a traitor. Not wanting to leave, we research options for trees that grow quickly, that won’t spread too widely and have non-invasive root systems. We think of planting in strategic locations and staying put. Then we remember all the cars and all the sounds and all the smells that would accompany a multi-unit building next door. The sounds of construction and later of arguments and loud music where there have never been any. The smell of cigarettes and bacon that would surely find their way into our windows make me want to bolt. I don’t know the answer yet. It may be that another home would be as inspirational as this one. Staying or leaving – it’s a gamble either way. Ultimately it’s difficult to imagine finding another place with such a long glistening throw of light as this one offers. 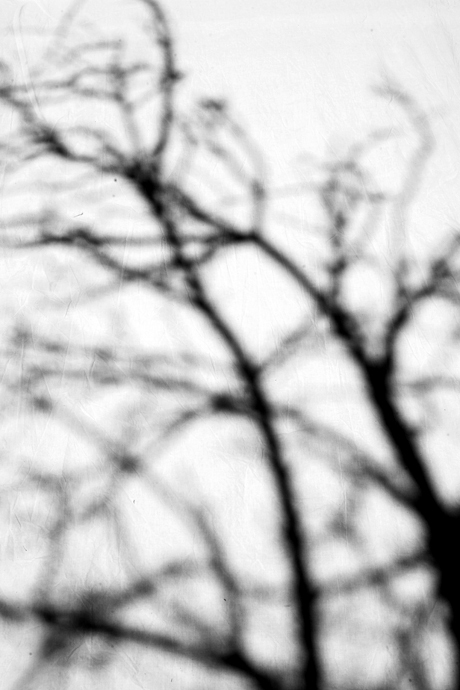 I was photographing the house, its grounds and light long before the developer’s call and continuing to do so feels empowering. 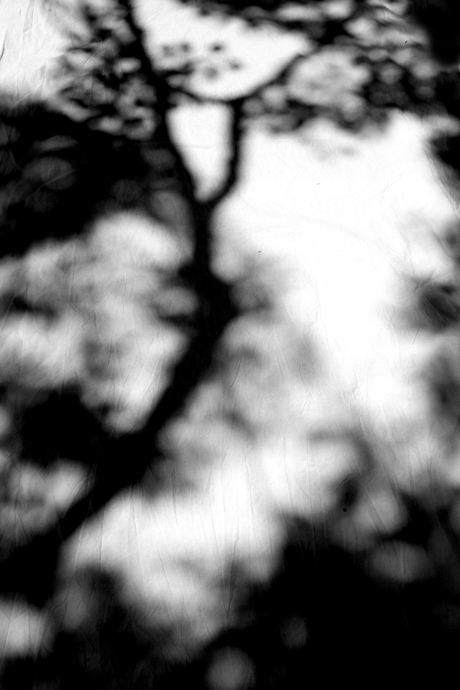 The work was shifting along the way, becoming more abstract. I’m not sure what role that telephone call played in making the black and white images – possibly a need to isolate an essential element of this place. 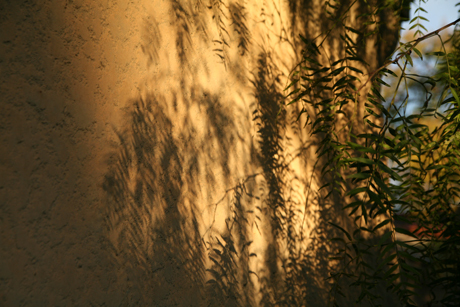 The botanical shadows were included in many of the color photos, but the emphasis on shadows rather than on the light itself was a subtle change. I don’t consider them darker or more sinister but perhaps they are in certain images. Maybe it’s just seeing the whole picture this time. 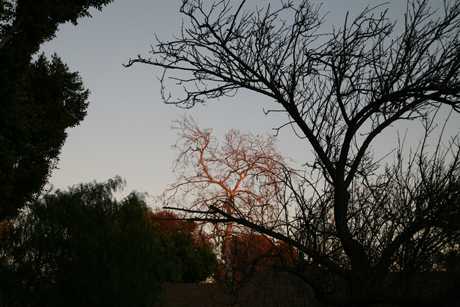 I’ve always had a tendency, when others are admiring a sunset, to look the other way. 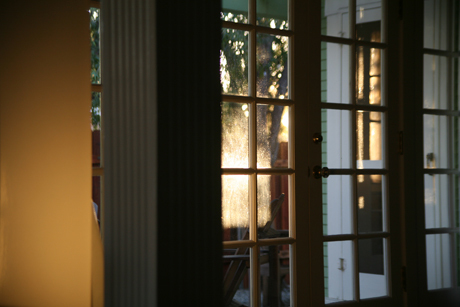 It’s my contrary nature I suppose, but I just really love the way everything looks when it’s bathed in the light falling at the end of the day. If, in the end, we decide to move on, I want a full recording of what happened here in September and December and April and July. 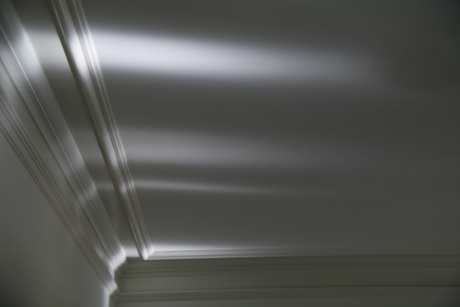 The light and all its changes of angle allow for different photographs every day. Most of them I do not take. Generally, I think the camera gets in the way of a lot of experience and I think taking it in is important in life. For every image I grasp with my camera, a hundred more are embedded in my mind, generally the place where the best photographs live. I live just a few blocks from the Miracle Mile in Los Angeles, a stretch of Wilshire Boulevard designed in the 1920s so that the buildings lining its curbs were intended to best be seen through the windshield of an automobile. This truly modern idea navigated passersby away from previous modes of pedestrian, horseback, wagon or train travel. Los Angeles was, until then, a series of dirt roads circumnavigating what once were Ranchos of epic scale. This urban planning led to a vast boulevard of simplified architectural forms, large, sleek, bold and ideally viewed at a steady speed of 30 miles per hour. The ensuing contributions to Streamline Modern and Art Deco vernacular are numerous and when viewed contrary to plan, as a pedestrian, were the first thing I thought of when Julia Dolan turned me onto the work of Ray K. Metzker, now showing at the Portland Art Museum. As the Museum’s new Curator of Photography, I should say Dolan turned Oregon onto Metzker, but having met recently at a dinner party at the home of my brother and sister-in-law, I felt motivated to look into his work and finally turn the familiar name into something tangible. What I found was an extensive body of work by a living photographer, as elegant and finely contoured as the cars he photographed. 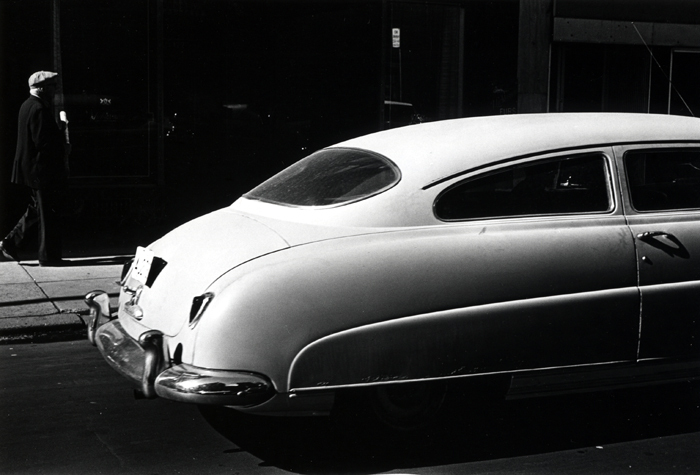 Ray K. Metzker: AutoMagic, an exhibition of more than sixty works by Philadelphia-based photographer Ray K. Metzker, complements the exceptional artistry featured in the Portland Art Museum’s summertime exhibition The Allure of the Automobile. 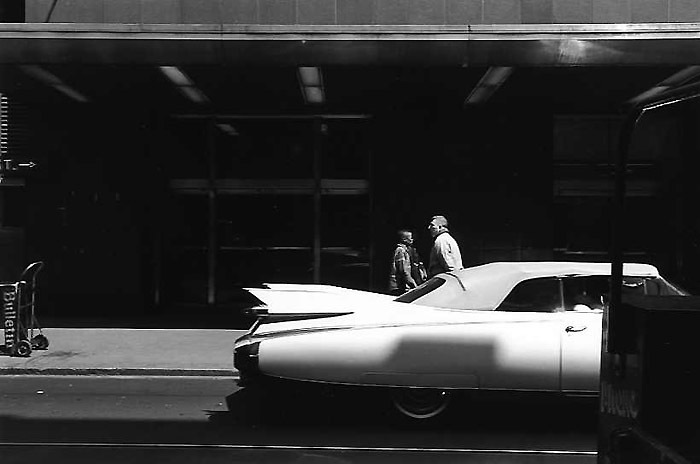 In a career that has spanned more than five decades, Metzker has continually photographed cars, charting their notable physical and cultural presence within the space of the modern city. AutoMagic places the vehicle within a broader social context by exploring the many nuances of auto-influenced urban behavior. 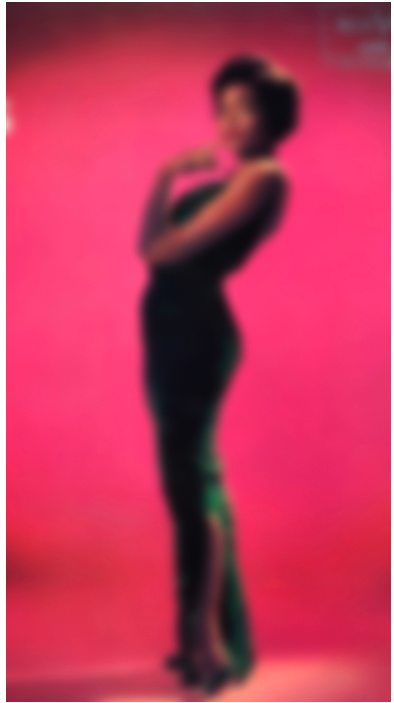 Metzker’s photography career began during the early 1960s, just as automobiles, parking garages, crosswalks, and traffic signals were becoming ubiquitous fixtures in many American cities. Metzker, who was already recording the design of urban spaces and public behavior, was poised to reveal the evolving formal and societal relationships among cars, pedestrians, and even architecture. In many of his photographs from this period, automobile form is paramount, and surfaces of smoothly curving metal are contoured by sunshine or artificial light. In other works, pedestrians and drivers commute along thoroughfares with efficiency, their aloof public personas masking their private lives. On occasion, occupants hang arms and heads out of car windows—relaxed postures that suggest a less hurried relationship between driver and destination. Although Metzker sometimes detoured from urban topics to explore new environments and camera techniques—examples of which can be seen in this exhibition—he always returned to the city and the automobile. 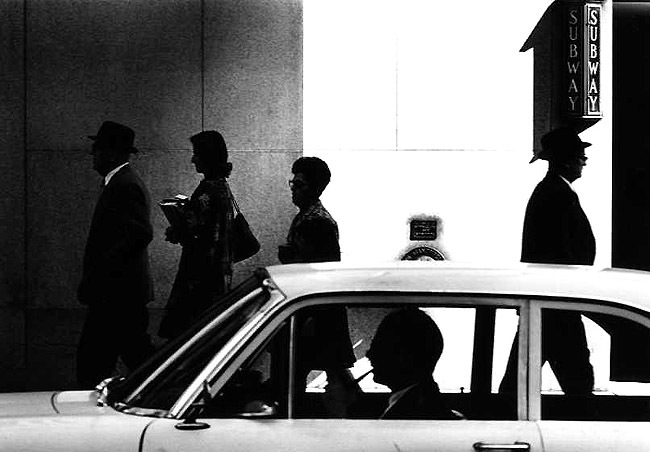 Indeed, Metzker’s ability to capture the essence of urban movement remains unfailing. Both automobile and human form are purely expressed and beautiful to behold in his photographs; tonal contrasts and an exceptional sense of composition amplify the intensity of purpose that moves commuters through the space of the city by car or on foot, perpetually suspended between one point and the next. 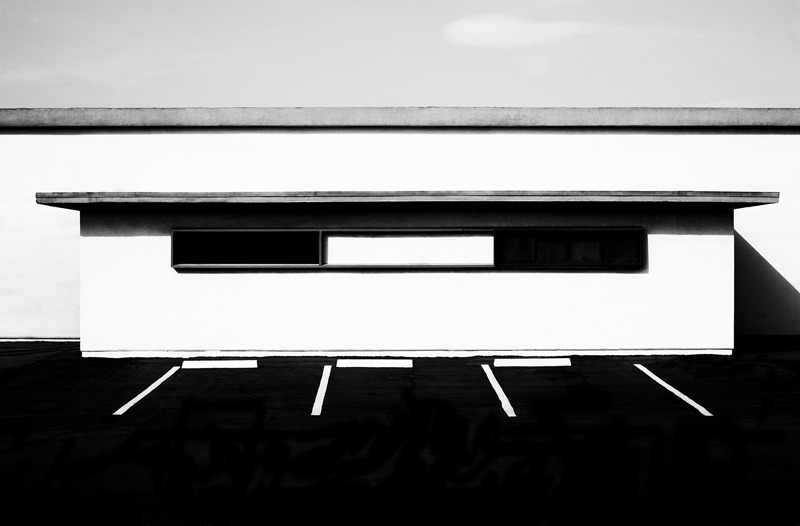 From decade to decade, Metzker treats the automobile as an aesthetic object and catalyst of social change, finding beauty as well as ambivalence in modern machinery. 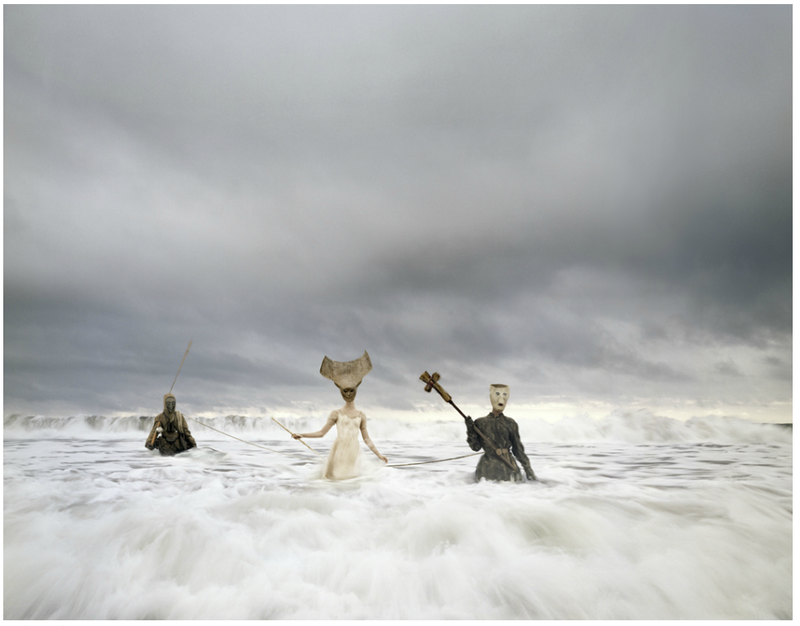 Prior to joining the curatorial staff in Portland, Julia Dolan was the Horace W. Goldsmith Curatorial Fellow in Photography at the Philadelphia Museum of Art and previously held positions at the Addison Gallery of American Art, Phillips Academy in Andover, Massachusetts and at Harvard University ’s Fogg Art Museum. She holds a Ph.D. in Art History from Boston University, an M.A. in Art History from Penn State, and a B.F.A. 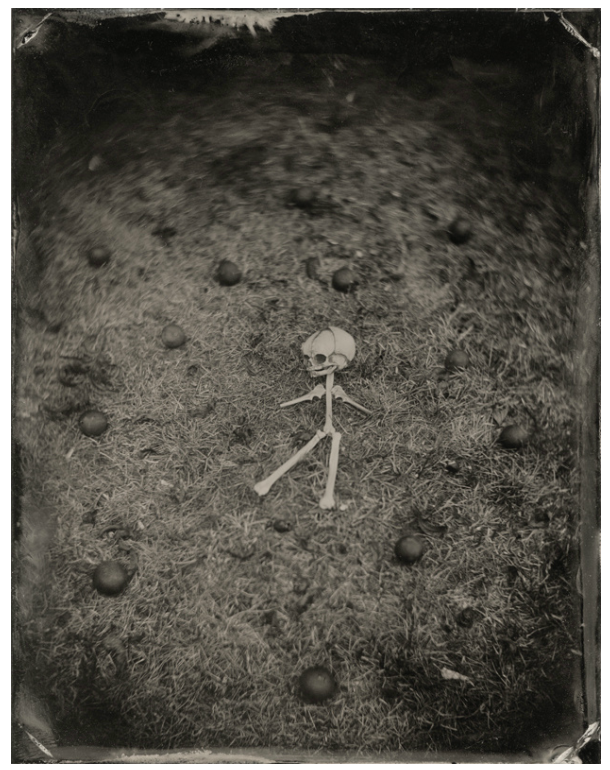 in Photography from Maryland Institute College of Art. All signs point to Dolan being an outstanding addition to the cultural life of photography. She was gracious enough to take time from a busy schedule to address my questions regarding the Ray K. Metzker: AutoMagic exhibition, as well as her plans for exhibitions and collections. 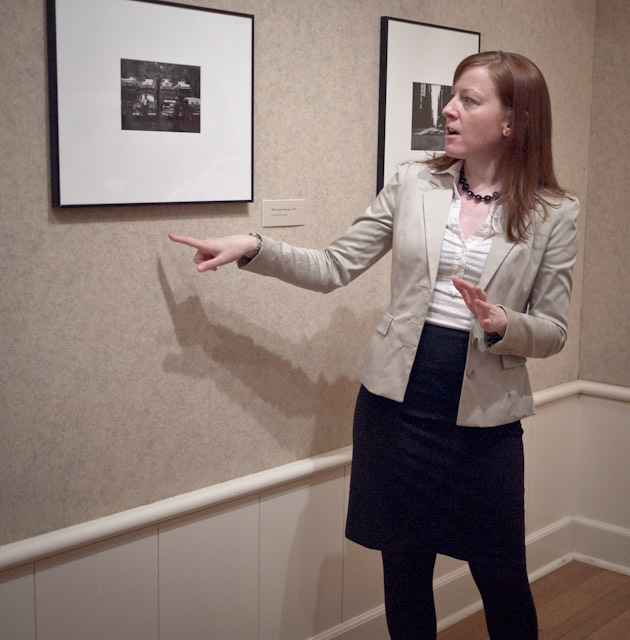 Curator Julia Dolan presenting Metzker's work to the Portland Art Museum's Photo Council. When you elected to show the Ray K. Metzker work was it a collective goal of the various museum divisions to run related exhibitions in conjunction with one another? In this case, yes. I knew that I had the gallery space near our special exhibition galleries during most of the run of The Allure of the Automobile. I didn’t feel the need to show cars, but I wanted to express some kind of issues around automation–Machine Age imagery, for example. But then I revisited Ray’s work about a year ago and felt that it would be a perfect fit. Did you have a prior relationship with Metzker when you were in Philadelphia? I stood in the same room with him once, and I was able to see his many prints in storage there, but no, we didn’t meet officially. I was too nervous to say hello to him. Is there a Metzker image that has a special hold on you – one that makes you stop in your tracks as you walk through the gallery? There are so many, it’s hard to isolate just one. That’s why I brought out 67 prints from New York! Metzker exquisitely captures the manner in which pedestrians move past and around automobiles as they make their way through the space of the city. His vision is particularly exceptional with this kind of scene during the early 1960s and in the City Whispers series from the early 1980s. Have a look at almost any shot from these periods, you’ll see what I mean. Will you talk about where you’re heading with upcoming exhibitions? Short term and or long-term goals? The permanent gallery space for photographs is meant to display photographs from our permanent collection, which numbers about 6500 photographs. The images selected for this gallery depend on various themes that I develop as I learn more about the collection. It can hold as many as 75 photographs. The images are rotated every 4-5 months so that regular visitors can see a variety of images, and also to protect the prints from too much light exposure. 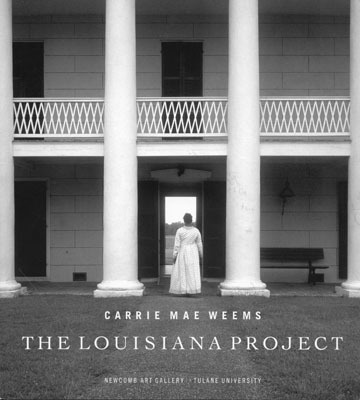 In 2013 we’re hosting Carrie Mae Weems: A Retrospective, which is organized by the Frist Center for the Visual Arts and will travel to the Cleveland Museum of Art as well as the Guggenheim in New York. My main goals include keeping the rotation lively in the permanent galleries, getting to know more about the region’s photographers, adding to the collection, and bringing in major exhibitions when possible. I’d like to originate a major traveling exhibition at PAM, but that is a longer-term goal. Carrie Mae Weems, "Slow Fade to Black #1, (Eartha Mae Kitt)" 2009-2010, courtesy of the artist and Jack Shainman Gallery, NY. Carrie Mae Weems, born in Portland, will return with a retrospective. Knowing that funds are short these days, adding to any museum’s collection is a bit of a pipe dream at the moment. 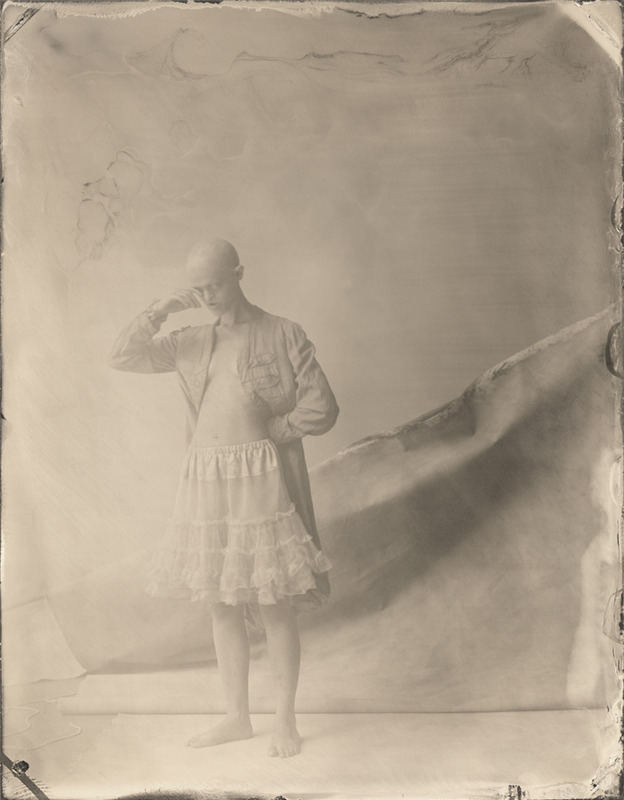 Daring to dream, are there specific works or genres of photographs that you would target as high priorities to begin to round out the collection at Portland Art Museum? 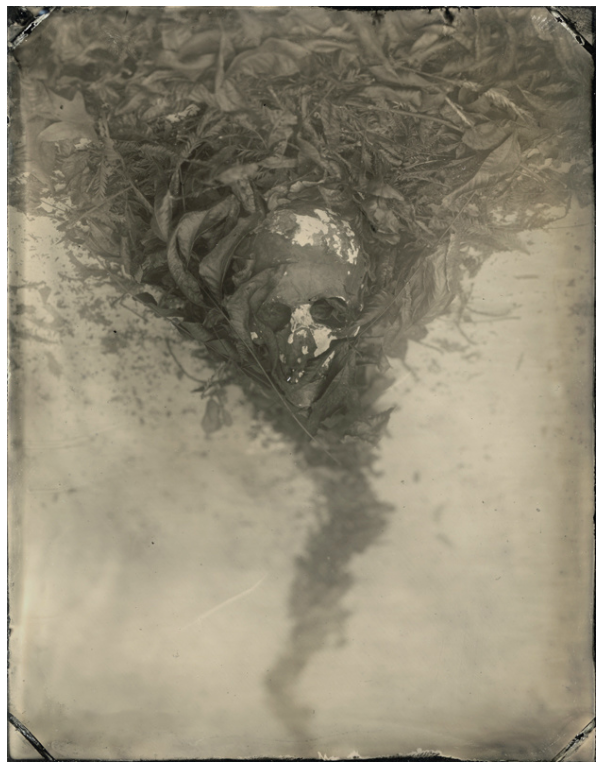 I am most concerned about bringing more twentieth-century photographs into the collection. We are missing a number of important photographers, and could use more images by certain artists. I always pay attention to contemporary as well, but I’d like to shore up the twentieth century as much as possible. 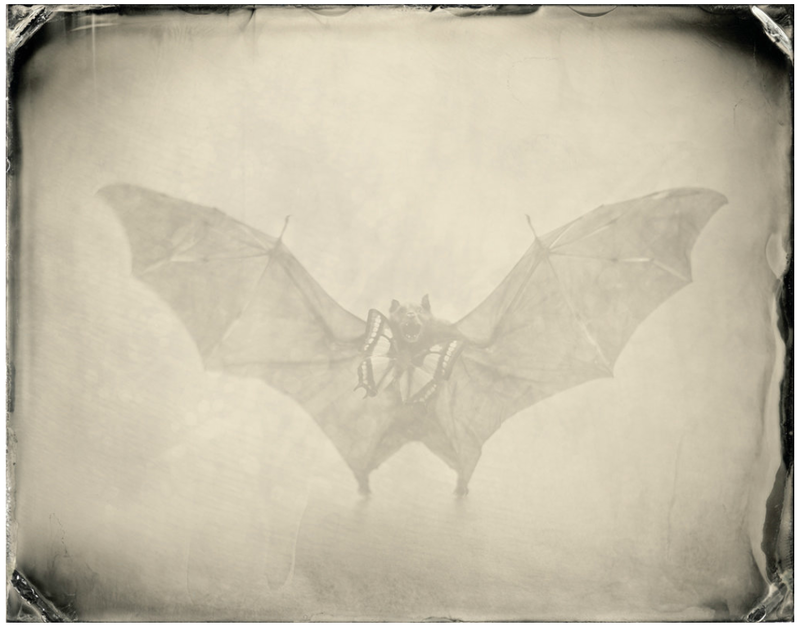 We need to encourage a collection that can hold its own and make Portland a destination for the study of the history of photography. Installation view "Looking In: Robert Frank's The Americans" at the National Gallery of Art. Can you give an example of a particular exhibition in which you felt curatorial inspiration? Specifically, a stand-out job by another curator and how that presentation really worked for you? Looking In: Robert Frank’s The Americans was an incredible exhibition. 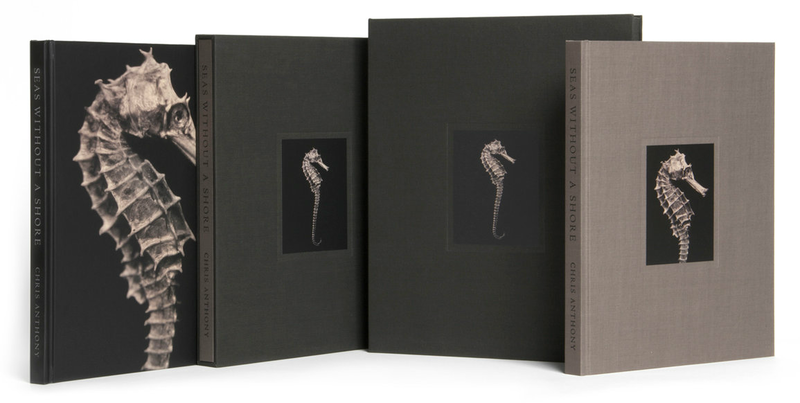 It’s hard to deny the power of Frank’s book, but to see his thought process through work prints and contact sheets was a revelation. Sarah Greenough from the National Gallery of Art made that exhibition sing. 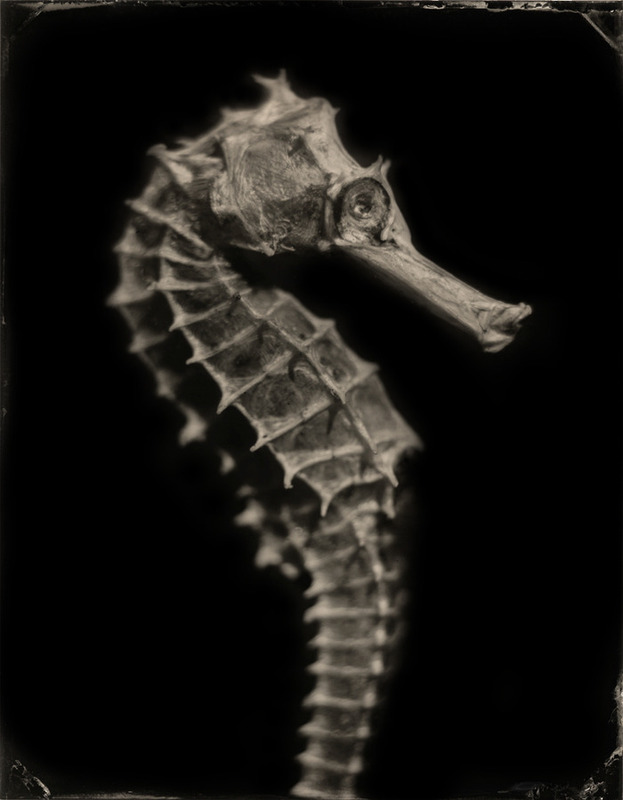 And the Metropolitan Museum of Art’s recent Stielgitz/Steichen/Strand demonstrated just how much an institution can do with a solid permanent collection. 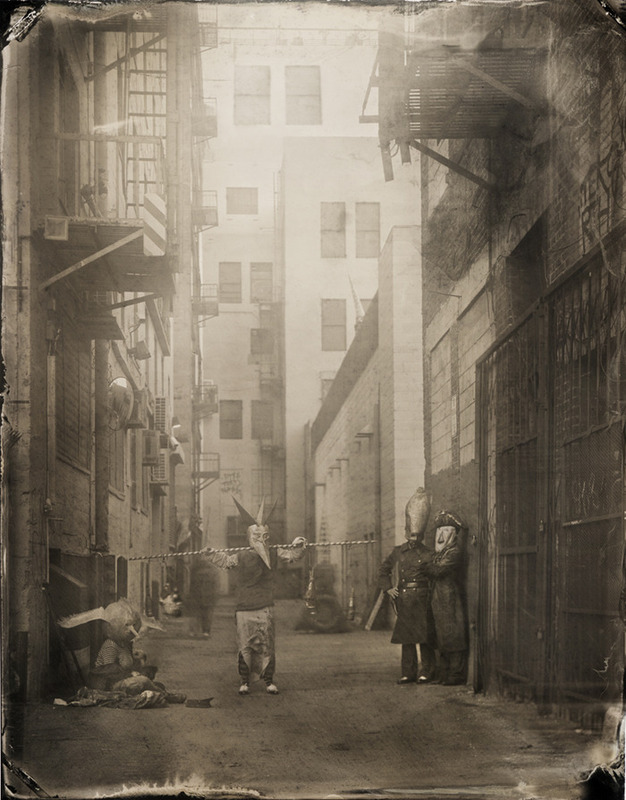 On this side of the country, the recent exhibition of Seattle Camera Club photographs at the Henry Art Gallery was fantastic, featuring lots of rarely seen works. In the years between being a photographer and being a curator of photography, has the shift altered the ways you appreciate imagery or drawn you to work you may not have experienced in the same way as an artist? Perhaps not directly. It was time that I took to grow up, but not to think about art critically. That period made me a better worker, more dedicated, more rigorous. I transferred that energy to art history when I finally decided that it was the route I wanted to take. 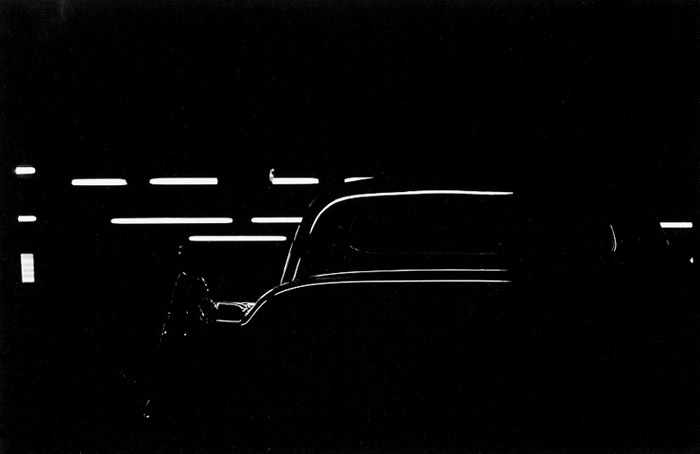 The Ray K. Metzker: AutoMagic exhibition runs through July, 2011 at the Portland Art Museum. In addition, The Allure of the Automobile is on display through September 11th, featuring 16 of the most rare and beautifully designed automobiles built between 1930 and the mid-1960s. 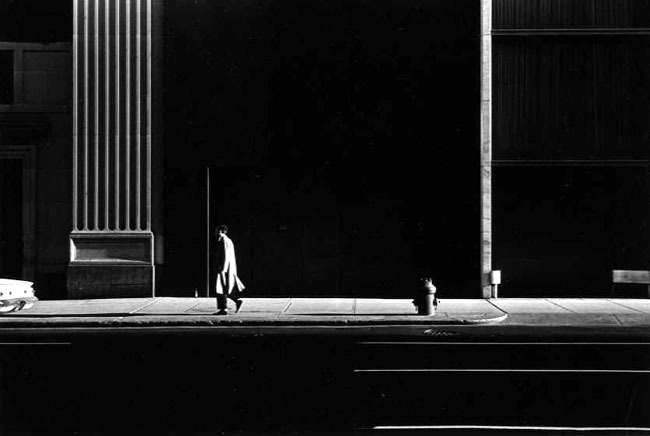 Photographs by Ray K. Metzker are published here with the permission of the Laurence Miller Galleryof New York, which represents the work of Mr. Metzker. 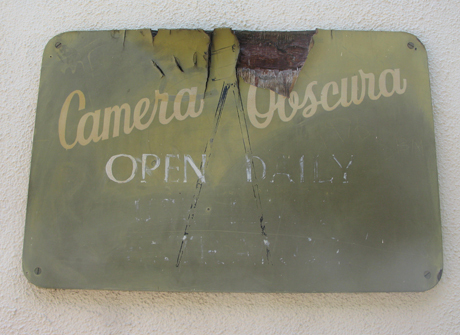 Santa Monica's Camera Obscura in its original location on the boardwalk at the beach. Summer is upon us and I’m well on the way to faking a vacation until a real one manifests. 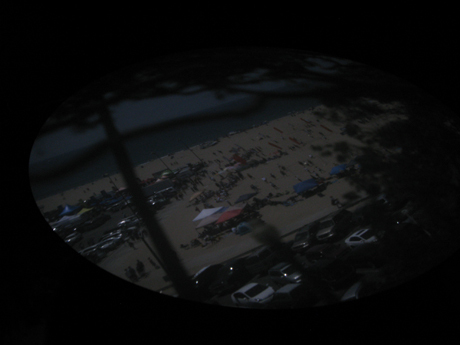 For locals the Camera Obscura in Santa Monica is a familiar haunt, and on a sunny beach afternoon, it makes a pleasant side trip. For visitors to Southern California this is an off-the-path treat, located right on the beaten path. It’s the one tourist attraction in the region that only takes a few minutes to experience. Odds are there will be no travelers other than you clamoring to get in. There is no waiting line and no fee to pay. In its original oceanside location amid an entire turn-of-the-century amusement complex that included a bowling alley and curio shops. The structures are all long gone. 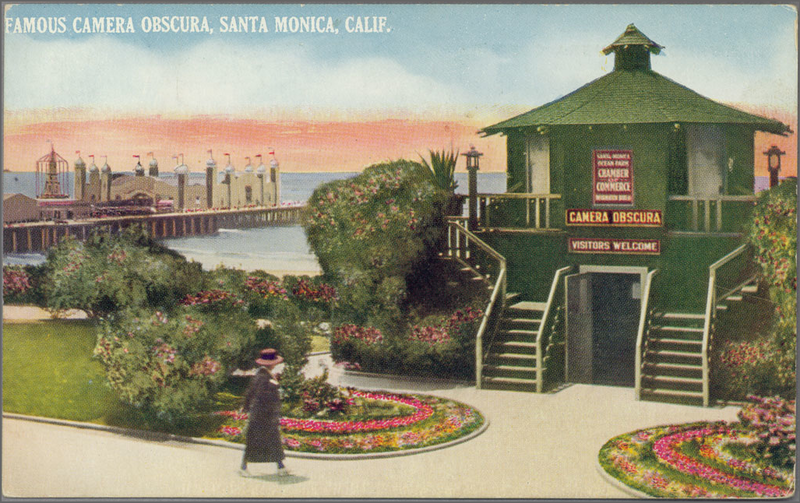 Designed and donated to the city by Robert F. Jones, nephew of the founder of the City of Santa Monica in 1898, the Camera Obscura is located on the beautiful Palisades Park walkway on the bluff above the beach and Santa Monica Pier. Antique pinhole cameras like this one were once popular at seaside tourist attractions in the years before motion pictures came into being and considering this is one of only two left in California, it’s a rare treat (The other is located at San Francisco’s Cliff House). 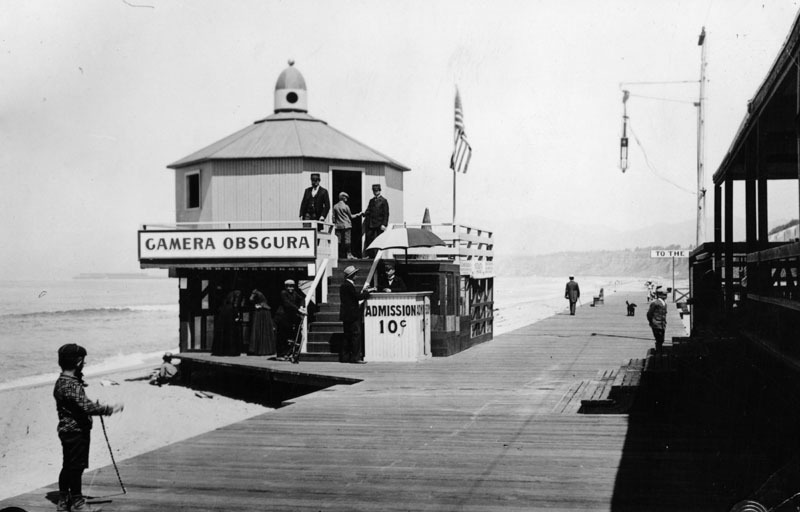 Originally located on the boardwalk at the beach below, the city moved the Camera Obscura to its current location to escape the harsh effects of weather in the early 1900s. 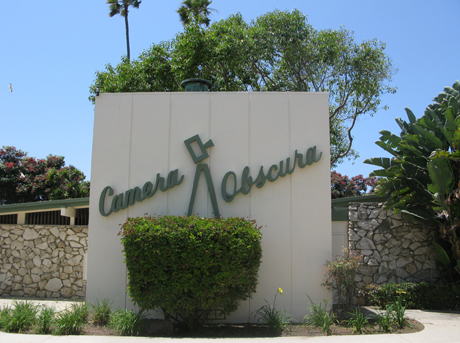 In 1955 local architect Weldon J. Fulton designed the mid-century Senior Recreation Center which has housed the Camera Obscura ever since. Fulton incorporated local stone for its façade and a hip diagonally mounted googie font and camera design that nearly outshines the actual camera obscura. Welden J. Fulton, architect, circa 1955. 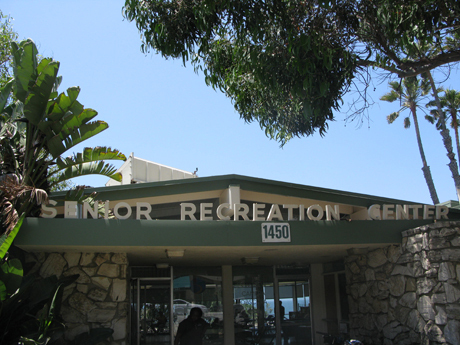 You may feel as if you’re intruding as you enter the Senior Center with its serious chess players and an assortment of elderly who just need some company and a view of the sea. Rest assured you’re in the right place. Just inside to the right, you’ll need to exchange your driver’s license at the office for a key to the Camera Obscura room. 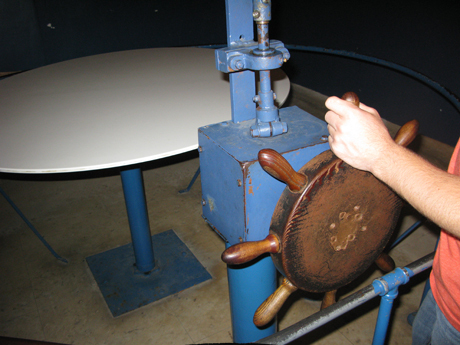 Once inside the darkened upstairs chamber, visitors can rotate an old nautical wheel to operate the 360-degree revolving turret on the rooftop. 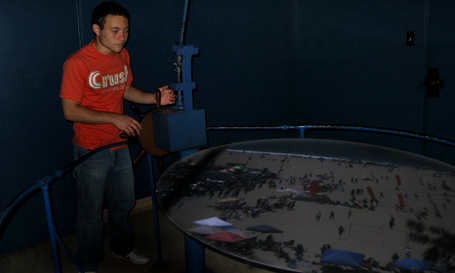 A mirror in the turret reflects the live scene outside through a convex lens onto the circular table in the middle of the chamber. Voila! You can watch bicyclers ride past on the street outside and sunbathers with umbrellas on the beach without the requisite sun block. There are no instructions but the table can be tilted to improve focus. While the trees outside have grown considerably over the years blocking part of the view, there are still clear vantage points in several directions and the clarity is surprisingly good on a bright day. 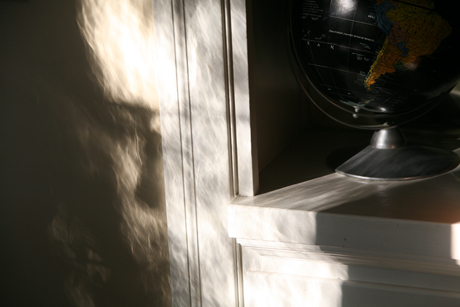 The Camera Obscura in action. 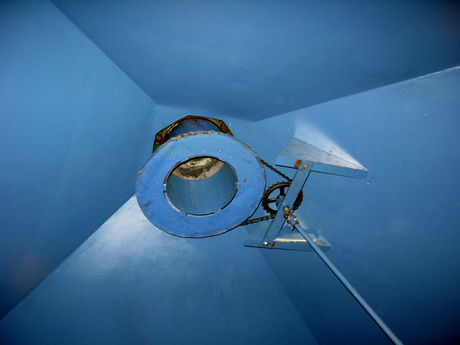 The ship's wheel in a fully lit chamber. 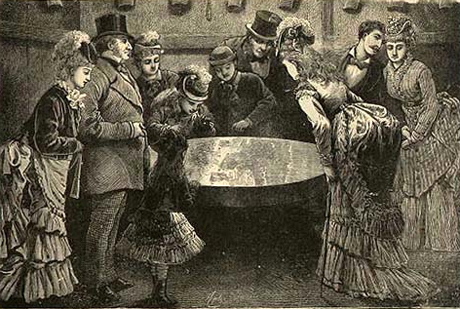 Victorian era magic in the darkened room. From Central Park's camera obscura with a much better dressed crowd. The mechanics that rotate the revolving turret. That’s pretty much it. It’s just a few steps to the pier which houses a vintage carousel, modern amusement park, seafood shacks and an aquarium operated by Heal the Bay. Your photo-weary traveling companions won’t be too put-out by adding an old-fashioned look-see to your modern itinerary and you’re close enough to grab an ice cream and stroll on the beach. 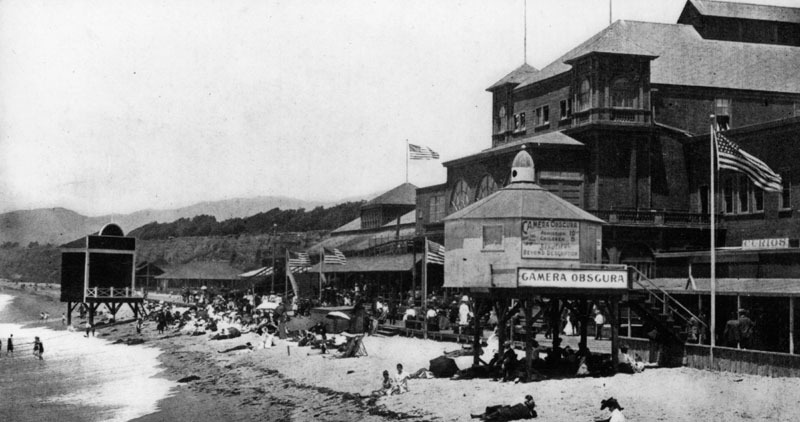 1890s, Camera Obscura in the distance, left, with the original Santa Monica Pier.